A young Dr. Alexander auscults a Manatee while young Dr. Zechar restrains the creature. 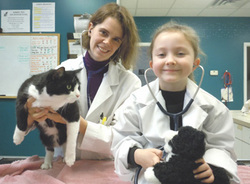 Almost every week, friends and clients tell me that their child wants to be a vet. Though many kids will move on to other aspirations, a surprising number will stick to it. When I was 8 years old, I wanted to be a “professional mountain climber," but I know many veterinarians who knew that this is what they wanted to do since they were young. (I still haven’t figured out how I was planning to support myself by climbing mountains). For kids who are interested, there are lots of ways to prepare, starting at a young age. Reading books on animals can help to build knowledge and interest; I loved “Quick as a Cricket”. I also love the TV show “Life of Mammals,” which is full of awesome footage and well-researched facts. Taking kids to visit a veterinary clinic can be a great experience, and many vets are happy to oblige. Michigan State University hosts an event called Vet-A-Visit that is worth checking out. Above all, exposing children to animals is probably the best way to support their interest. This can be accomplished by giving them specific responsibilities with family pets, involving them in 4-H or taking them to zoos, sanctuaries and interactive farms. Starting in high school, kids who want to be veterinarians should begin to consider what it takes academically and experience-wise to get into vet school. Ways to get animal experience are to volunteer at kennels, shelters and other animal operations or to work as a veterinary assistant. Not only does it booster the application later on, but it also allows teenagers to get a better picture of the profession and decide if it is right for them. In fact, most schools require several hundred hours of experience shadowing a vet or working at a vet hospital before an applicant will even be considered. Strong grades in math and science provide a good foundation and help ensure acceptance into a four-year college. In college, some of the most popular undergraduate majors are biology, zoology and animal science (though I do know one vet who was an art history major). The reason is that there are a large number of prerequisites for veterinary school that vary from college to college, and these majors are most likely to fulfill a good amount of the requirements. So it’s also a good idea to start looking at the lists of those requirements during the first year of undergrad when choosing classes. Getting into vet school is very difficult these days because of the popularity and limited number of schools. The average GPA of undergraduate students admitted to veterinary school changes from year to year, but it’s safe to assume that aiming for 3.5 or higher is ideal. When considering a career in veterinary medicine, it is also important to know what training is involved. Most veterinarians complete a four-year undergraduate education prior to entering veterinary school. Veterinary school itself is also generally a four-year program. After vet school, you are able to practice medicine, though several doctors go on to a yearlong internship to prepare for residencies or gain extra experience. Those who wish to specialize in a specific field of medicine (dermatology, oncology, zoo medicine, etc.) often go on to another three years of residency. There are some downsides to being a vet that need to be considered. In addition to performing euthanasia, there can be a lot of anxiety over making the right medical decisions and helping pet owners decide what’s right for their families. The cost of school is also a huge burden. Though being a veterinarian offers decent pay and job availability, most new veterinarians graduate with $100,000-$250,000 of debt. And lastly, you have to be comfortable with poop… I deal with a lot of poop. In the end, it’s a great profession. The job allows us to connect with a community, keep intellectually stimulated, try exciting new things and play with lots of puppies (I don’t think I’ll every get sick of the puppies). Even if your child decides they want to do something else, learning to apply themselves to their studies and get experience working with animals will serve them well in whatever path they take.